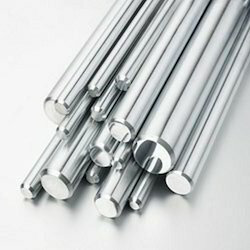 Offering you a complete choice of products which include aluminium alloy round bars. With limitless experience information of this industry, we are engaged in giving an exceptional range of Aluminium Alloy Round Bars to our valuable clients. Our offered alloy round bars are extremely praised by our clients because of its features like optimum performance, corrosion proof body, and long functional life. The offered alloy round bars are made up of fine quality aluminum latest tools. Looking for ALuminium Alloy Round Bar ?